Adam Beland gave up getting his hands greasy five years ago. That's when he bought a Crest Bike Parts Clean and Lube System for his store, Bicycle Outfitters of Seminole, Florida. "The Crest system allows us to get bike parts cleaner than we could by hand, plus it allows us to continue working in the shop while the parts are being cleaned," says Beland. "So we save time, which saves us money. We also use the Crest system as a sales tool in our service department. We tell our customers that we will get their bike parts cleaner because of the Crest. Our Crest system has definitely paid for itself." A Crest Bike Parts Clean and Lube System is an all-in-one system that eliminates contaminates in bicycle parts in 10 minutes. Just turn on the Crest ultrasonic cleaner, drop the parts in the special water-based cleaner, let set for five minutes, blow off, then move to the lube station. Leave for five minutes, blow off again, and the cleaning is complete. The parts come out entirely clean and with a thin film of a light lube. Jesse Lalonde, the service manager at the Trek Bicycle Store in Madison, Wisconsin says their Crest system makes bike parts cleaning quick and easy. "The second you get the parts off and into the cleaner you're already washing down the bike and moving on to other tasks. The Crest system has cut our parts cleaning time in half. I can still remember when we sent our system down to another Trek store that was just opening and before we got a new Crest system, I couldn't believe how long it took us to clean the parts by hand." And the Crest performs its tasks economically, as well. A drive train costs about 75¢ to clean, and a chain, around a quarter. 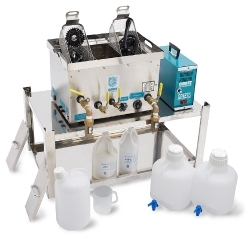 Purchase a Crest system that allows for conservation of the chemicals and lube, and the per parts cleaning cost drops by two-thirds. "With the Crest system derailleurs come out looking like you just pulled them new from the box," says Ron Lopez, service manager at Encina Bicycles of Walnut Creek, California. "I also like the Crest because the chemicals are biodegradable and easy on your hands and bike parts, and the system is really easy to clean." Is more efficient than hand cleaning. Completely Safe  chemicals are non-hazardous, biodegradable and emit no odor. Eliminate costly chemical disposal fees. Features four systems to choose from, starting at $995. CMR Sales Inc. is the exclusive distributor of the Crest Ultrasonic Firearm Clean & Lube Systems and Bike Parts Clean & Lube Systems for over 10 years. The company's president has over 14 years experience of ultrasonic cleaning in various industries. CMR Sales and Crest Ultrasonic Helps with Your New Year's Resolution: Cleaner Bike Parts  And at $100 Off!